After I started cycling, I have come to realize that there are lots of benefits associated with this sport. Cycling typically combines physical exercise with being outdoors and exploring new views. Exercise, on the other hand, can have nearly endless positive impacts on your wellbeing. You can either ride alone, which gives you time to process your anxieties and worries. Ladies, it is also a great way to lose some extra calories. With Daylight Savings time upon us, the days are getting shorter, meaning it is getting dark earlier. Avid cyclists never stop riding just because the sun has set. If anything, night cycling can be an exhilarating experience, and sometimes, for commuters out there, it’s the only way to get home! However, truth be told, biking at night is relatively more dangerous than day riding. This is why most people dislike it. After all, it is cold and dark outside, and we all know cold is the enemy of women. As humans too, we’ve also been conditioned to fear the darkness of the night. However, with the correct mindset and equipment, night riding is totally safe and enjoyable. Here are our five MUST-HAVE night-cycling tips you need to know. 1. Enhance your visibility as much as possible. The chances are high that you’ll be venturing into unlit country lanes, so you need an efficient source of your own light to illuminate your path. This is the only way you’ll be able to identify those potholes as well as other potential hidden dangers. Your bike’s lighting system should have functional rear and front lights. A good lighting system not only allows you to see clearly where you are going but arguably most important, to be seen by others. Science has proven that visual perception decreases dramatically at night and this implies that it takes relatively longer to identify traffic signals, stray animals and even pedestrians. In this situation, all you need are LED lights which generate much better light quality compared to their halogen counterparts. If you didn’t know, they emit very similar to daylight, which greatly enhances your visibility. Another piece of advice is that you must ensure your lights’ runtime is longer than your planned ride. With that in mind, it is also a good idea to travel with a couple of small backup lights just in case your rear lighting system fails. 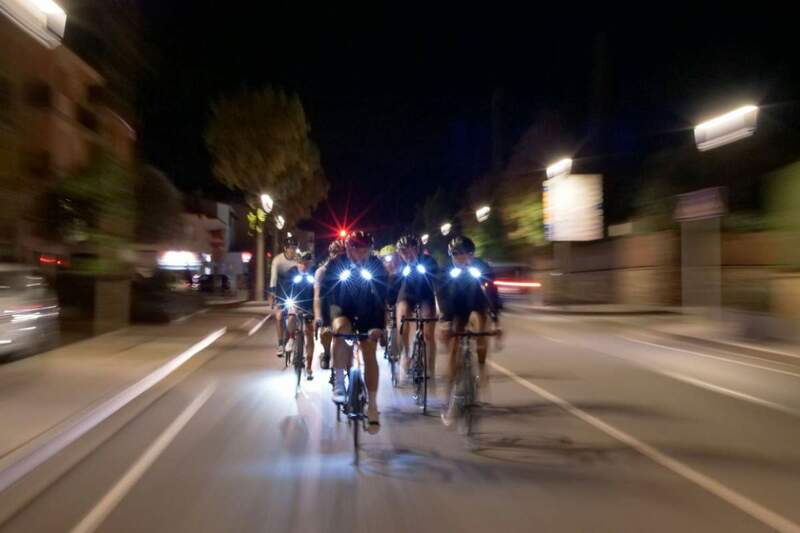 The most common and dangerous mistake casual bikers often make is to underestimate their visibility at night. You want to be seen by cars because chances are, they have a harder time seeing you than you seeing them. Most bikes come equipped with some reflective features, but always err on the safest side and get more gear. Have plenty of retroreflective surfaces on your equipment on your bike. Also, your clothing must be highly reflective. Do not wear black! I know black is slimming, but it’s dark at night, be as visible as you possibly can! Thankfully, there are lots of great reflective wear out there on the market. It is at the middle of the night, nowhere to turn to, you are terrified and to spice things up, your bike develops a mechanical problem! What if you have a flat tire and there is no mobile service to call for help? Fixing a mechanical problem in the dark is not much fun. It only means that the first thing to do before you set out for a night ride is to ensure your hybrid bike is in tip-top condition (or carry a flashlight with you!). This minimizes the risk of a mechanical failure while you are away in the wilderness. Even though most hybrid bikes should be good enough to cope with all sorts of terrain without developing problems, it is a good idea to take precautions. I have heard horror stories of people who go on long rides in the dark without a repair kit. For those who are paranoid that they will experience mechanical problems, here is a brief list of items you should have in your repair kit. Your repair kit must be equipped with high-grade tools, probably made of steel, so you don’t have to worry or think about damaging the delicate parts of your bike. Thankfully, there are lots of high-end repair kits for hybrid bikes out there and you can always get the one that suits your needs. Finally, don’t forget to carry your mobile phone with you. Fully charged. If anything dangerous happens, you’ll need to phone home for further assistance. It is always better to plan your journeys and night bike riding is no different. Whether you are just going out to explore your world or you are just going for a casual night ride, planning ahead makes your journey less strenuous and more awe-inspiring. Have a picture of the route you would want to travel. Because it is your first experience, you would want a route you are familiar with. Equally, select your roads carefully and avoid poor surfaced routes. I have always had problems with the road with potholes and gravel. They can be dangerous for first-time riders! If you intend to explore a new route, explore that route in the daytime to ensure you are familiar with the area. Another option if you dare to venture out at night is to ride with a friend, especially for women. Riding alone at night as a beginning cyclist is highly dangerous, especially if you will be biking in areas with less people. Make sure the routes you pick at night have plenty of human presence so you can get the help you need if something goes wrong–knock on wood. Cold is arguably your worst enemy in the long dark, so bundle up! It has been proven that women are more sensitive to cold than men, so stay warm. Adapting to the cold weather in the dark isn’t that easy, and thriving in the wilderness can be even harder. To enhance your chances of survival, you need water, some food, and shelter. The shelter can come in different forms, ranging from caves, huts and any other structure in that area. Anything is better than being outside. Find a heavy jacket that boosts your warmth. Food and water is what will keep you going. Carefully calculate how long your ride will be and pack at least 1 hearty meal to keep you going–About 1,500 calories should be enough. It is critical to note that food not only can keep you energized but also keep you warm and strong. I can’t stress this enough, so I’m going to mention again. I don’t know where you will be traveling, but it is always important to stay visible to cars and passing pedestrians. No matter how slowly or precisely you think you may be biking, there are always people out there who will be surprised by your audience presence. Be sure to buy the appropriate reflective gear to ensure that people behind you can see you and know to avoid clashing with you. Riding a bike at night can be an enjoyable experience, especially when you and your hybrid bike are prepared for it. I was lucky to find a great hybrid to suit my physique and cycling habits. Check out these top picks for best hybrid bikes for women to get started on cycling! I hope these tips can minimize some fears you may have had about riding in the dark. Explore them, stay safe, and enjoy your next experience! My name is Bee and while I am no cycling pro, I am your average bike fan who hates driving cars and not very savvy at public transportation. I love sharing my experiences with fitness, weight loss, and general health and wellness through biking in urban and suburban settings. On the weekdays I bike to work in the city, and on the weekends I frequent some casual biking trails for exercise. Check out some of my contributions on https://onesportninja.com too!